Today I’m so excited to share with you the final reveal of our kitchen renovation! I think you will agree this is a pretty mind-blowing transformation and we did it without removing a single kitchen cabinet. Obviously, this saved us an enormous amount of money and yet it didn’t diminish the impact of this dramatic kitchen renovation. I’m including a few ‘before and after’ photos because I think the difference is so compelling. The photo below shows you the original kitchen as it looked before the renovation. We had already replaced the lighting over the island when we moved in a year ago, as well as painted the walls greige in anticipation of the project I envisioned. Below is the same view in the completed kitchen and you can see nothing was moved from it’s place and yet the striking change and overall feel is like the difference between night and day. From dark and depressing with no real design sense, the kitchen is now light and airy, with a French influenced sensibility and antique touches to play off the classic details. 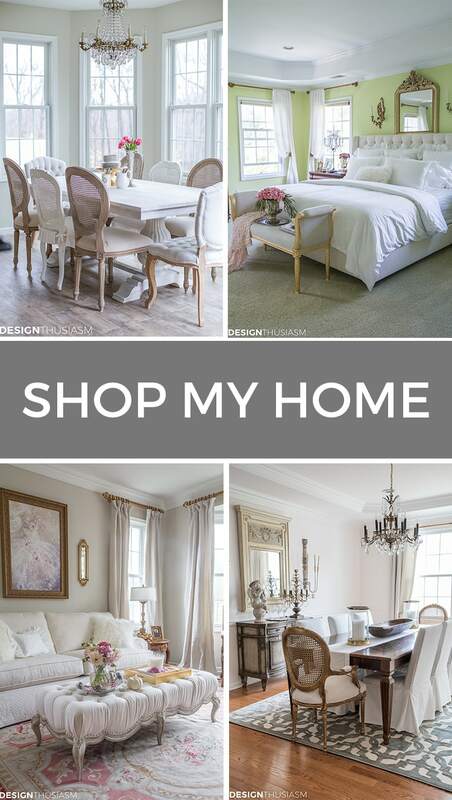 I’ve detailed the construction in the last few weeks’ (which you can access at the bottom of this post), and this week I focused on styling and ensuring the space reflected my taste and lifestyle. I try to keep my counters relatively clear and spent a good bit of time shopping for just the right accessories to accommodate the things I deemed necessary to keep readily available. 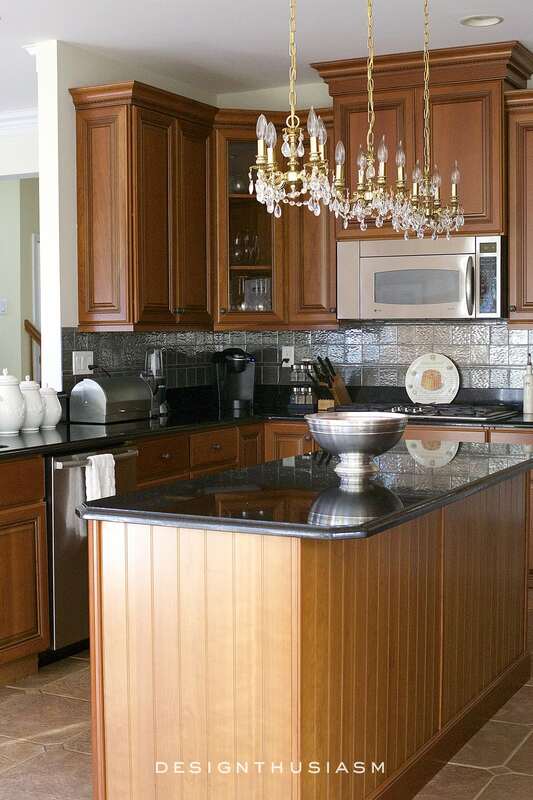 The previous kitchen was dominated by dark cherry cabinets, a muddy toned ceramic floor and black granite counters. The choppy backsplash was part granite and part steel grey tile and the net effect was dour and characterless. It felt oppressive to me every time I walked into the room. 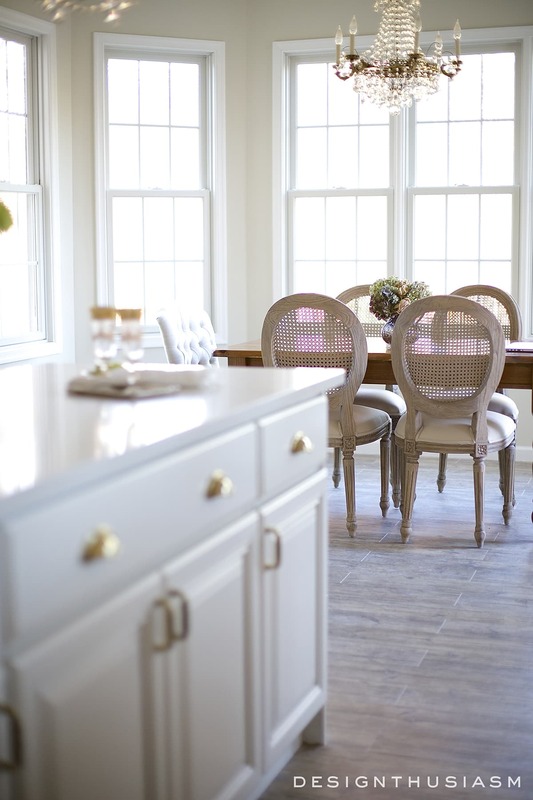 Without a doubt the most significant change was brought about by painting the cabinets, but of equal importance to defining the new look was adding glass fronts to the doors. This opened up the whole space while providing both storage and display options. 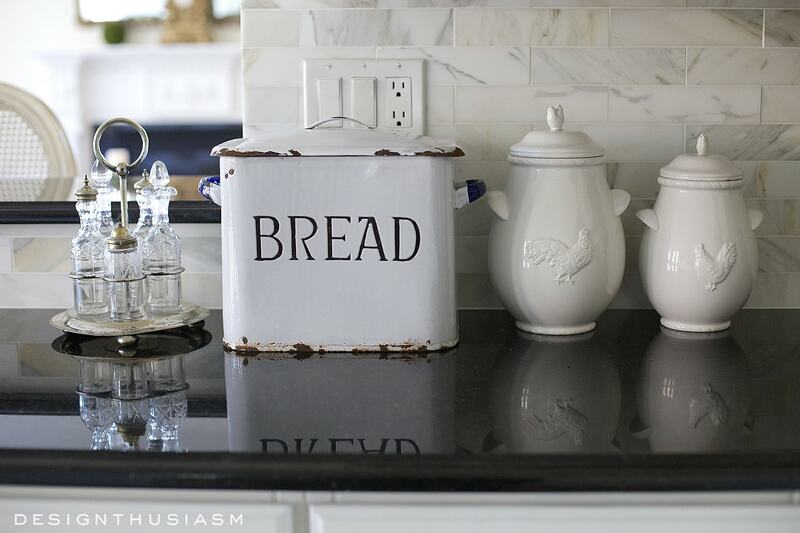 I chose to go all white when styling the inside of the cabinets for a tranquil and organized look. 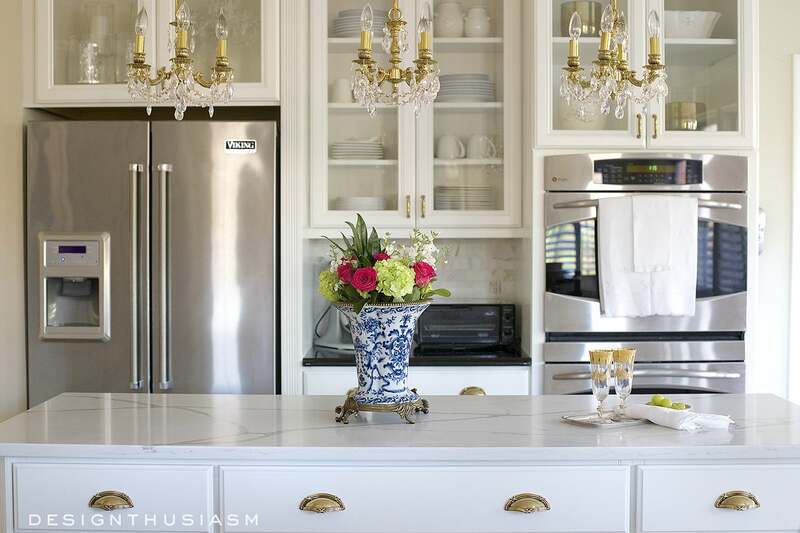 The beauty of a white kitchen is that it can be accessorized with pretty much any color. The pink and green floral adds a delightful pop of color, as the chinoiserie vase lends a classical note that works perfectly with the design of the kitchen. A last “before” photo, below, shows one of the darkest angles in the room. I worried that this view would never be filled with light, but alas, the transformation is remarkable. Bolstered by the new marble backsplash and white quartz on the center island, this vantage point now reveals an extraordinarily evolved perspective. 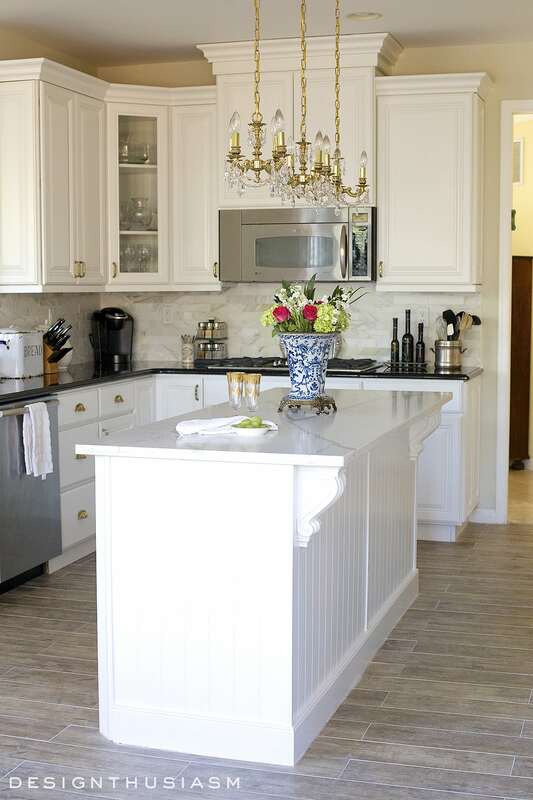 You can also spot the scrolled corbels that were added for polish beneath the countertop. The lovely new floor is also visible here, which gives the room its essential character. The view from the den is among my favorites because the light openness is common to both rooms. 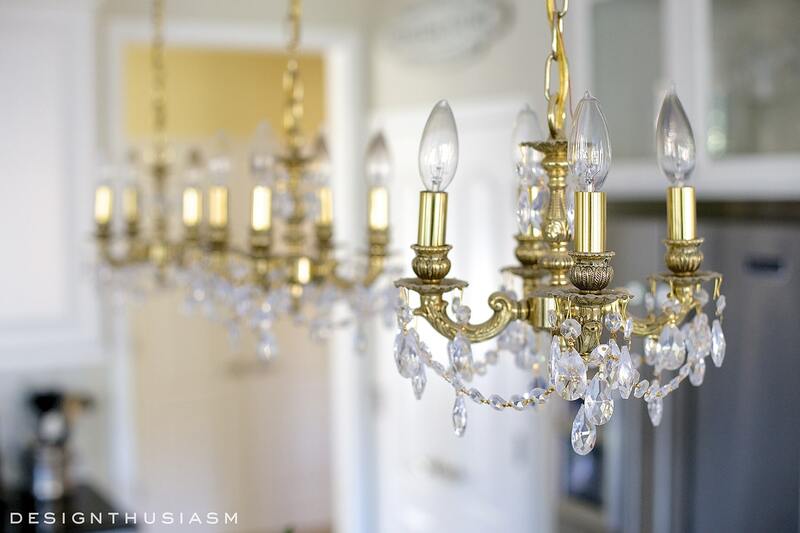 You can get a peek at our cabinet and bin pulls which complement the brass in the chandeliers. 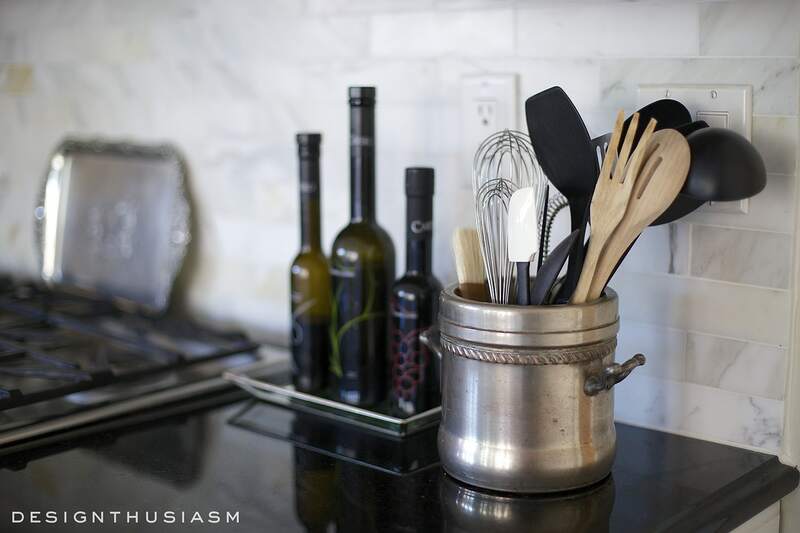 Next to the stove I’m using an antique silver ice bucket to corral all of my utensils. 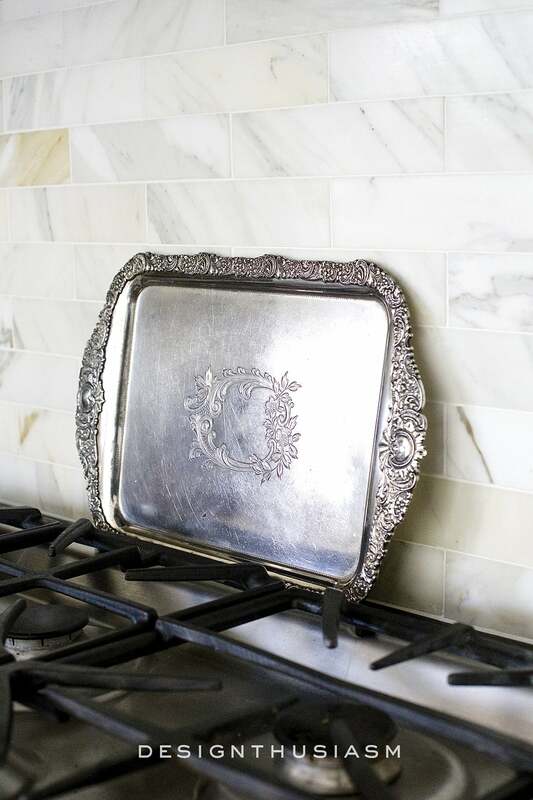 A vintage silver serving tray rests casually against the backsplash. This great little sign was added not long ago and is perfect above the pantry doors. I’d still like to add new door levers to dress up the pantry a bit. The wall color is Benjamin Moore Tapestry Beige which provides the perfect backdrop. 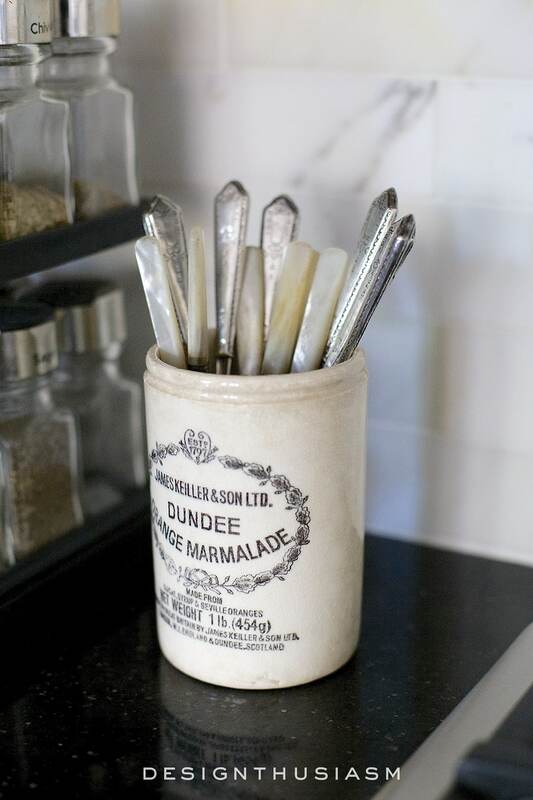 Lately I’ve had a thing for vintage marmalade jars and the one below holds antique silver dessert forks and mother-of-pearl knives. 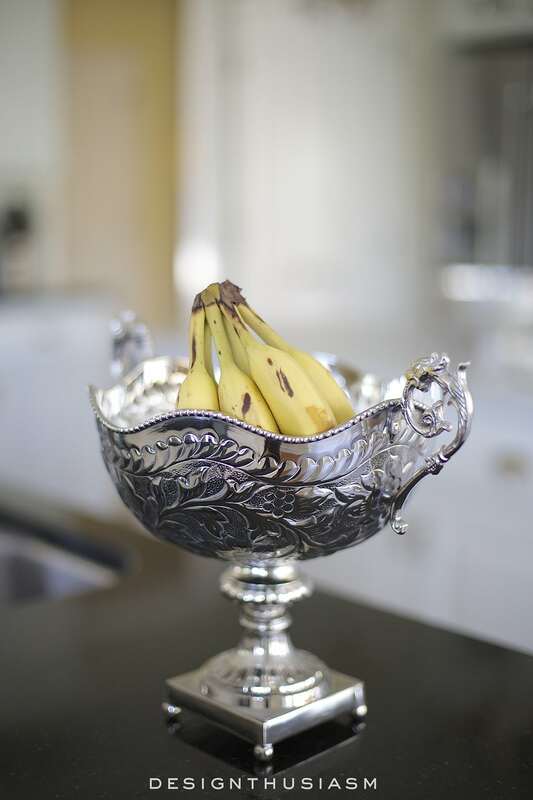 I’ve always love mixing metals in my decor and both gold and silver are utilized here. 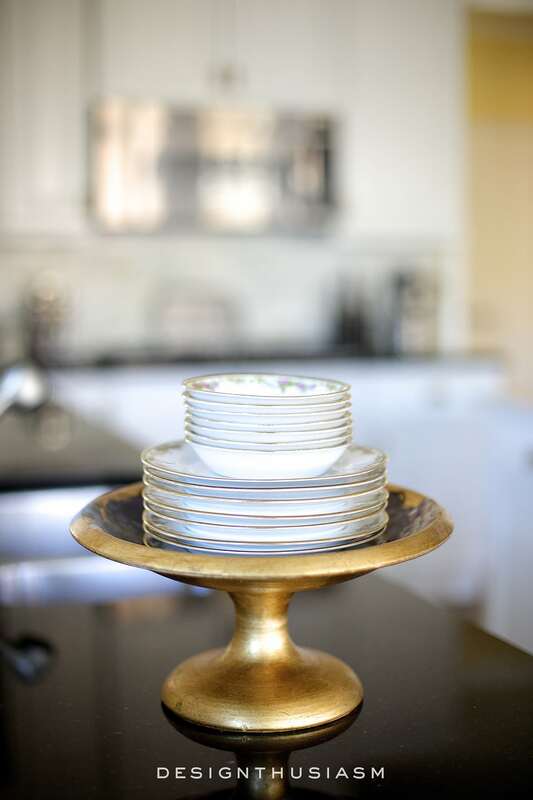 The shallow footed bowl holds a stack of plates for charm, as well as easy access. I love my trio of mini crystal chandies and they finally make sense in the renovated space. The final glimpse shows a peek at the breakfast area, but that’s still got some changes coming, so we’ll leave that for another day. I couldn’t be happier with this room transformation and how quickly it all came together. The money we saved by painting the cabinets and using existing appliances made the project very manageable. I’m already thinking about my next One Room Challenge and I can tell you it’s another biggie! 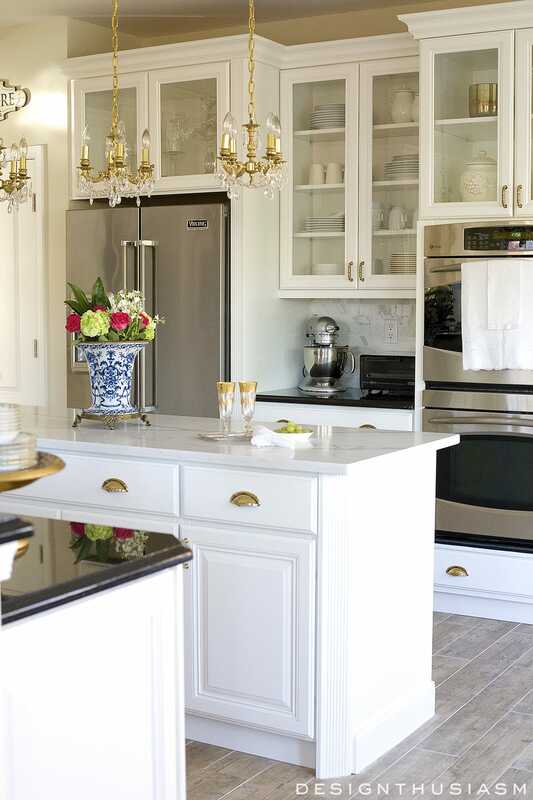 The paint we used for the cabinets is Muralo Semi-gloss in Benjamin Moore White Dove. Wow! What a difference! Love it! You did a fabulous job! Lots of personality! You must be very pleased! Beautiful!! What a great transformation! What paint did u use for the cupboards? Thanks, Jeanie! And thanks for reminding me – I meant to add that to this post and will add it in now. It’s Muralo Semi-gloss in Benjamin Moore White Dove. what a vision, lory! so inspiring. 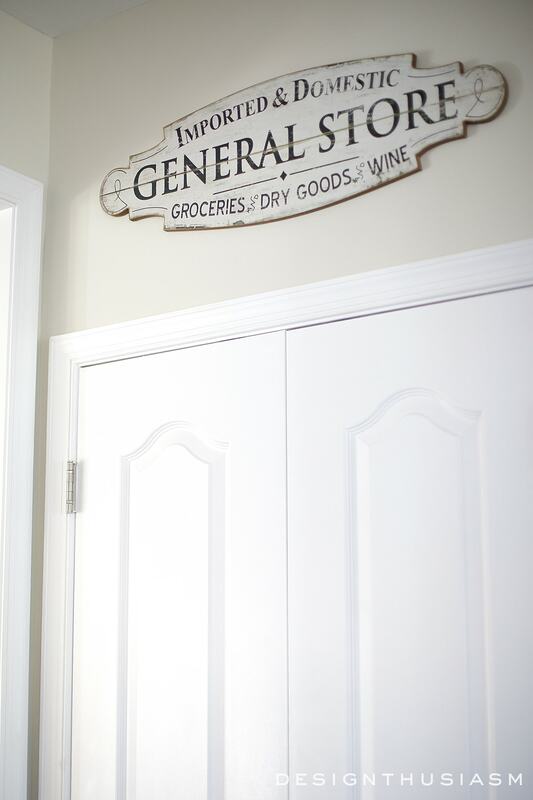 yes, the sign is perfect over a pantry! love how you have accessorized and thanks for all the links. is the banana holder something you already had? i’m crushin on it. now i want those floors! lol! Stunning makeover in every way! Love it! We had our formica kitchen cabinets painted Linen White- Benjamin Moore- and what a difference it made. 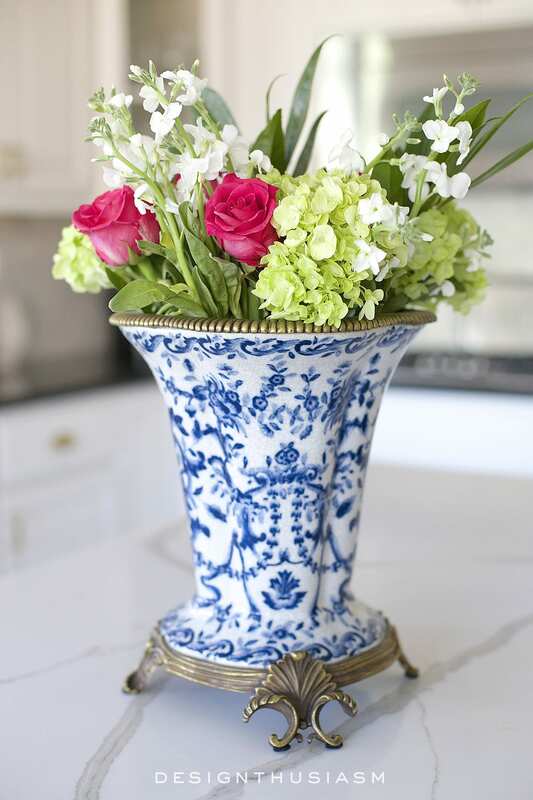 Love the blue and white vase! Where can I purchase one like it? Oh Lory! 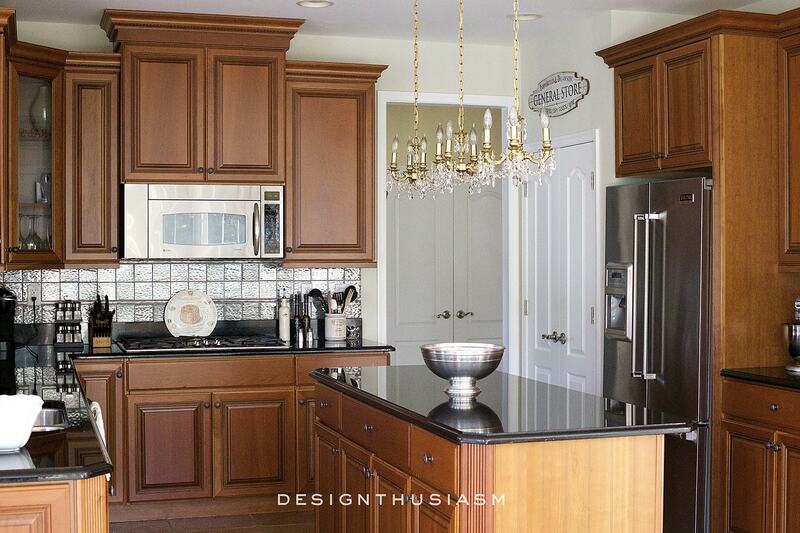 I am swooning over your kitchen renovation! It is all so beautiful! I love every little detail! Enjoy your kitchen every single day, I know you will! I’m amazed that the black counters don’t detract from the overall light and airy ambiance of the new kitchen. In fact, through the eye of the lens, the dark counters aren’t even noticeable. Impressive! So excited to see this final reveal, and it’s a stunner!!!!!!! Love all the accessories, too. Isn’t it amazing how transformed something can be in a short amount of time? Even all the clean-up is worth it when you love the finished look. Enjoy, enjoy, enjoy. Oh Lory! It’s gorgeous! I probably would have slept in there the first night after competition because I couldn’t drag myself away. Enjoy! I said WOW out loud twice when I saw the pictures. This is beautiful! You did a wonderful job. Lol, that’s both funny and nice to hear all at the same time… 🙂 Thanks, Elizabeth!! it’s amazing what a little (or a boatload!) of white paint can do! beautiful!!! Lory!! It’s beautiful and so fresh! Seriously, I bet you just feel so calm and serene when you are are in there now. Love it so much! Congrats on such a beautiful space! Lory – this is gorgeous!!! It looks like a completely different house! We’ve painted kitchen cabinets and it’s a bear of a job, but this. This is a stunner!!!! LOVE the white and I know you are loving it! I sure am, Kim… 🙂 Thanks! I’m looking forward to following your renovation too!! Beautiful before and after. I would love either one but my favorite is the new kitchen because I love the happiness it brings to the room. Great choice and thank you for sharing. Lory! What a stunning transformation!! Well done! I love the trio of chandeliers. 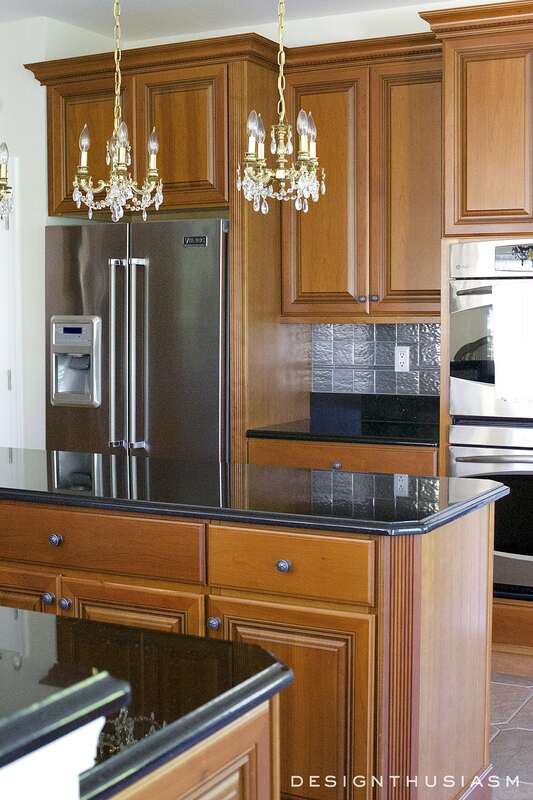 One thing I noticed right off the bat was the addition of the corbels and maybe a tad bigger island countertop? Perfect! All the glass doors are the perfect touch. Bravo!! Thanks so much, Emily! Yes, actually the island counter is the same size and it always drove me crazy that the overhang had no corbels, nor is it deep enough for barstools. An odd thing, but the corbels made all the difference. Thanks for the kind words! Lory, your kitchen looks absolutely amazing. I love all the white!!! Have a GREAT weekend! Lory, your new kitchen is so beautiful! You have done such a great job with absolutely everything! Enjoy! What a bright, clean, beautiful transformation! It is wonderful down to the very last detail! Thank you for sharing!!! Thanks, Teresa! Thanks for visiting!! Lory! It looks so good! What a dramatic before and after. I’m sure walking in there every morning just makes you smile. Awesome job! Oh the power of paint! It’s amazing! Congratulations, and enjoy! So true and thanks so much, Iris!! Lory, what a gorgeous renovation! 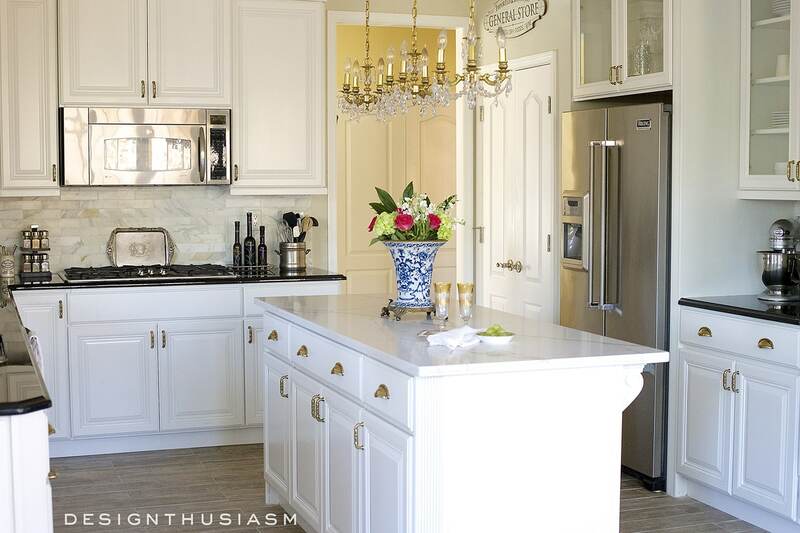 I love white kitchens and I so agree… everything goes with a white kitchen! Beautiful! How did you paint your cabinets? I’m thinking about doing this but wonder did someone paint them or did you? Any suggestions would be appreciated! Stunning results! Thanks, Debbie! We hired a contractor to paint them. I detail the process in the post before this. It’s linked above under “Painting the Existing Cabinets”. It’s certainly possible to DIY it but I didn’t want to take a chance given the quality of the cabinets. Looks wonderful! We have been struggling with the decision as to whether to paint our cherry cabinets white, but had never seen any “before” and “after” photos like yours. Husband thought it would be a travesty to paint them, but thanks to your photos his mind has been opened! Might I ask if you had them sprayed, or did you actually hand paint them your self? Thanks, Jan! We had them sprayed. The post before this one details the process a bit. It’s linked above under “Painting the Existing Cabinets”. Thank you, Oksana, and thanks so much for sharing!! Looks really great Lory and I’m glad that you went the route of not just ripping everything out! Lory, is the most beautiful kitchen I have seen recently .It is amazing how at one time cherry cainets were and are so beautiful but wow, what a difference the paint made. It just opened everything up and looks sooo wonderful. Thanks, Kathy! Yes, a lot of people still love cherry and it can look beautiful. I think it just wasn’t done well here, but also, I simply always wanted the white… 🙂 Thanks for the kind words!! What a big difference paint makes. Your kitchen is so much lighter and brighter. I was wondering about painting your cupboards. Does the BM paint cover smoothly without being sprayed? Your accessories are the topping on the cake. If I didn’t just buy new upholstered chairs for my eating area I would absolutely go for those cane back chair. 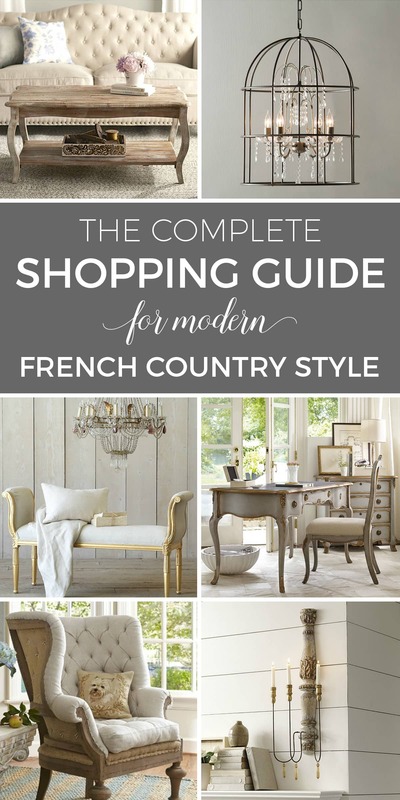 They add wonderful texture as well as that French feel to the room. Thanks, Joanna!! Yes, I’m really happy with the chairs. 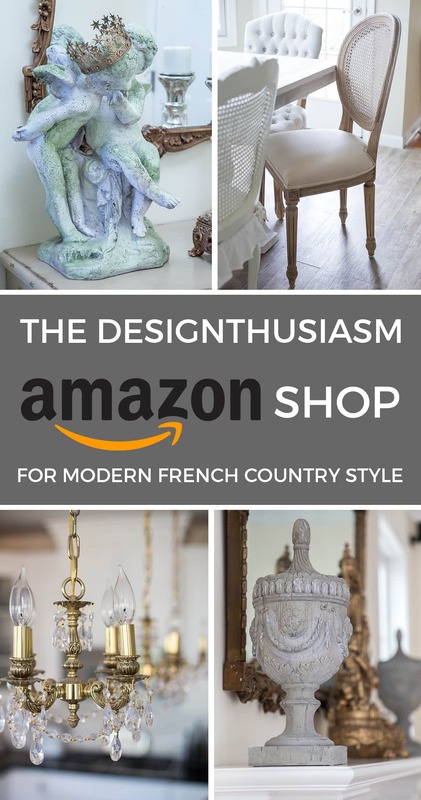 I didn’t focus on them because we will be changing the table soon and styling at least the tabletop, so you can look forward to that down the road… 😉 As for the cabinets, the doors were sprayed and are much smoother than the sides which were painted by hand. Lory, I knew this reveal was going to be beautiful but it is even more stunning than I imagined! I love every detail from the amazing backsplash to the corbels on the island. Congratulations on a gorgeous transformation! Lory, what a most beautiful transformation! Thanks for the inspiration as if we decide to remain in our house and not build the downsized home, then the first thing that will be done is to renovate our 11 year old kitchen. Bravo…a job well done!!! Thanks so much, Shirley! And I know that feeling of ‘should we stay or should we go’ all too well, because we went back and forth with it for a few years. When we moved into this house last year, I made it clear I wanted to re-do the kitchen before we agreed to buy… 😉 Good luck whichever way you decide to go!! Sooo sooo gorgeous! I love how it turned out!! WOW! A testament to the Power of Paint. An amazing transformation! Just beautiful. This is incredible! The kitchen is so much brighter with all the white components. I love the glass doors on the cabinets. Beautiful! Absolutely stunning! 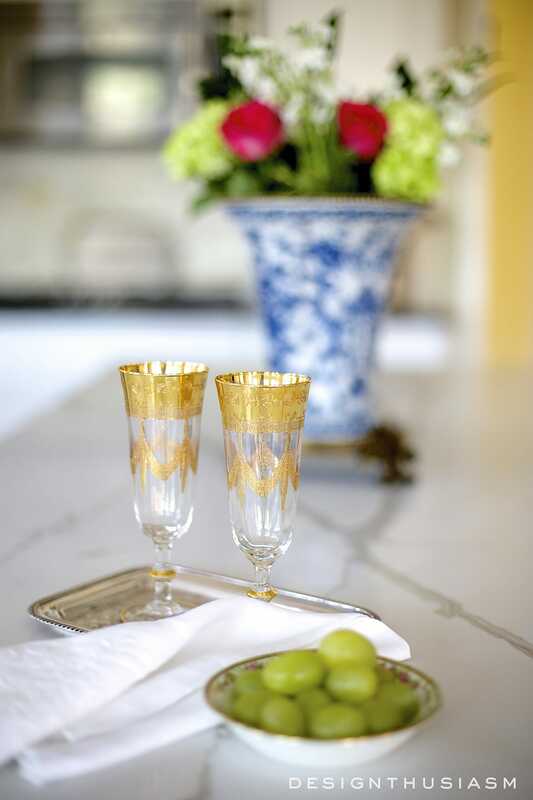 I love every single detail, and I am obsessed with that chinoiserie vase. Wish I could find an exact one like that! Hi, I had the same color cabinets and had a painter paint them white. They have since peeled even after having him come back and seal it with a polyurethane. How did you paint yours? I hired a cabinet maker. So far no problems, but it’s only been a few months. Fingers crossed!! Absolutely gorgeous! Planning on painting our oak cabinets white. 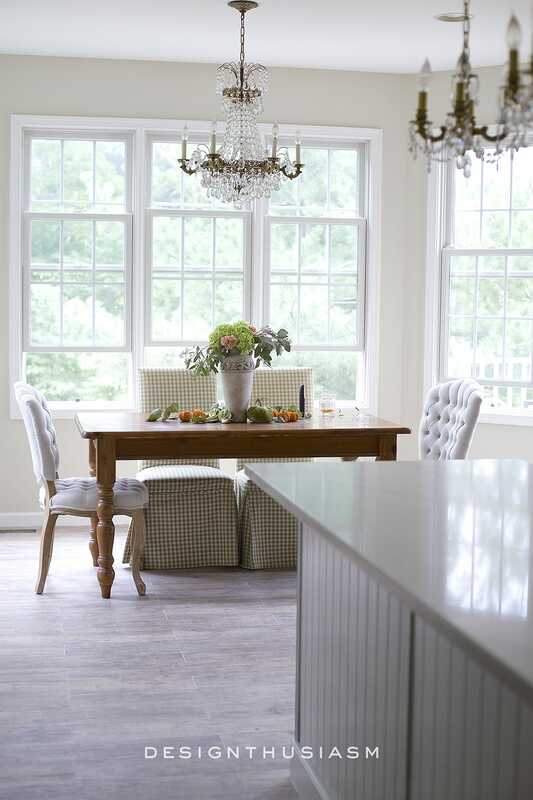 Did you use the same white for the cabinets and the woodwork trim? Thank you! No, the cabinets are BM White Dove and the woodwork trim is BM Simply White, a touch whiter. Wow….An amazing job. Love it. Do you have a rough idea how much the transformation cost. Thanks, Gina! I think the price would be dependent on where you live and what materials you choose. While it looks nice, cherrywood is tons more money then painted white wood. The cherry has a much more ritzy , high class look. Lori I so enjoyed looking through the pictures of your kitchen! So beautiful! What an awesome transformation. I really like the ice bucket for the utensils! Great idea! this is beautiful but I don’t see a reference for the floor?? Who made the floor? Maybe it’s just me but I liked it more before you painted the cabinets. I liked everything else you did, changing the back splash, island top and putting glass in some of the cabinet doors. I had white cabinets for years and finally changed them out for really dark wood ones. I guess I am just a fan of wood grain. Hope I have not offended you. Too much white is not my style. Hi Carroll! I can appreciate that my taste and style are not for everyone. It made me so sad to come into the kitchen in the morning and have it be dark and depressing. I love dark wood grains when they’re balanced against light bright rooms, like a beautiful piece of old wood furniture with lovely patina, surrounded by crisp white linens. But a full room of dark wood is not for me (unless it’s a sun-drenched old English library). The point of the post was to illustrate the dramatic change. I’m sorry you didn’t like it, but thanks for reading anyway. Color me green. Corner to corner, your kitchen is gorgeous. Love the kitchen and will be using BM White Dove for cabinets and currently looking at quartz for countertops. What is the brand of the quartz/name of quartz used? Thanks! So beautiful!! Thank you! I’m not sure. 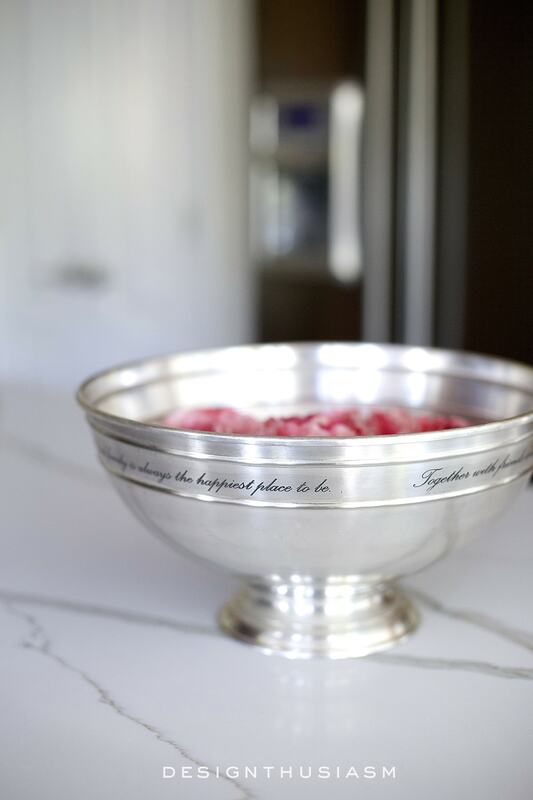 I picked a slab from a marble yard, rather than picking from a sample in a showroom. But I do think it was a calacatta quartz. Thank you so much for this post as I am right in the middle of deciding what in the world to do with my narrow galley kitchen. Now I can clearly see what needs to be done and I don’t have to be scared of painting my cabinets!!! We also have a dark spot in the corner of the kitchen that never seems to get enough light. I am going to download/save this post for my future point of reference. Thank you! I am so glad to hear you found it helpful!! Hi Lory, I wish you and your family a wonderful 2019! I just looked at your Home tour from the home you lived in for 20 years and I must say it was magnificent! I have very similar custom built maple cabinets and have been thinking about painting them. 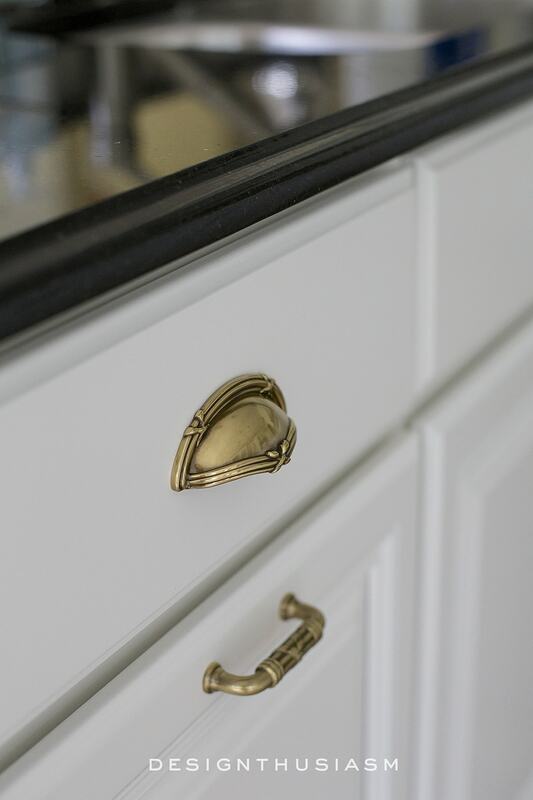 I have thought that a white glaze might get rid of the awful yellow tones in my cabinets (they are definitely dated) or would it be best to just go ahead and paint them. I see you painted the kitchen cabinets in your new home and they turned out so pretty. OK, my question is this– why did you paint the new cabinets and not the ones in the old house? My house is an open floor plan so I would have to do the same treatment to the cabinets across the room that is our living room area. I have oak hardwood floors so there is a lot of wood in the house. 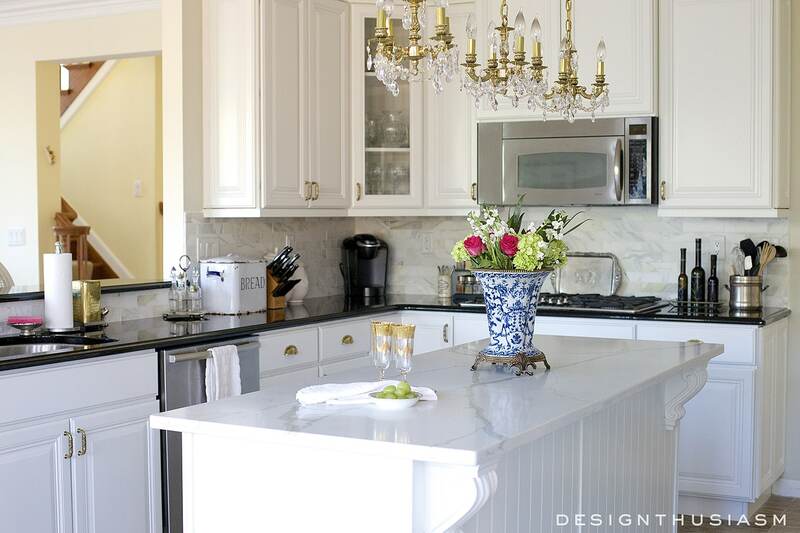 My counter top is a dark exotic granite and I love it — your black counter top works beautifully with your white cabinets. My house is slowly evolving into a English countryside style so I don’t like the golden maple in the cabinets. I would appreciate any thoughts you may have about the direction to go in with these cabinets!! Love your blog and look forward to seeing what you have for the new year! Oh gosh, this is so long and if I am out of boundaries for asking, please excuse me. Lory, it’s absolutely beautiful. What a difference. I love white kitchens and walls. All you have to do is change accessories and get a whole new look. I often refer to your style as ‘quiet elegance’ You never fail to impress. Thank you for the kind words and for your interest! Did you check your spam folder? Can you also tell me which box you used to subscribe, so I can try to fix it? If all else fails, I would try using a different box. If you didn’t already use it, try the bar at the very top of the website. Please let me know if you still have a problem. Thanks! !